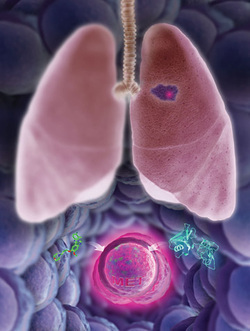 Non-small cell lung cancer is a type of lung cancer. About 85% of people who get lung cancer will get non-small cell rather than small cell. One of the biggest problems with lung cancer in general is that it is very hard to detect early because the people who have it often show no symptoms. My grandfather for instance was very recently diagnosed with NSCLC, more specifically with the sub category of adenocarcinoma, and the way he found out he had a tumor in his lung was from going to the doctor because of shoulder pain. There are a few treatment options for NSCLC these include: surgery to remove the tumor, radiation,and chemotherapy. For my grandpa surgery seemed like a really good option because his cancer hadn't spread, it was just the one tumor in his lung, and the surgeon said they could remove the whole lung and he would be fine. The only catch is that he would have to stop smoking for 3 months before they did it, and he would have to never smoke again for the one lung to be healthy enough to support him alone. This wasn't going to happen. He promised to cut back a lot, but he has never believed that he could fully quit. So we went on to option number two which was intense targeted radiation and chemo at the same time. This sucked all the energy he had right out of him, luckily there was another option: Crizotinib. Crizotinib, also called Xalkori, is a fairly new drug, taken twice daily, that has been shown to inhibit very particular cancer cells from reproducing. So particular that only about 4% of people with non-small cell lung cancer have the right mutation in a particular gene for this medication to be effective. My grandfather is one of those 4%. ALK is the name of this specific gene mutation. When it is present the medication is able to act as an inhibitor to the reproduction of the cancer cells. How does it affect the cancer victims? My grandfather has only been taking the medication for a short time and it is still too new to know a whole lot, but from what I have read online in the short term is that it greatly increases the overall quality of life while living with this cancer. It has been shown to stop growth of the tumors, and in some cases shrink them. We do not yet have enough data to know how it will react long term, but it shows a stop in tumor growth 3 times faster than chemotherapy and has a much better response rate. About 86% of patients have accomplished disease control. And all of this without the downsides of chemotherapy. My grandpa was telling us the other day about how some days the pill just makes him more tired than other days. My dad asked if the bad days are as bad as the days he had gone in for chemo and my grandpa just looked at him and said "Not even close, nothing is as bad as that." If nothing else I'm just glad that my grandpa found a solution that has better results than chemo, with less pain on his part. Crizotinib is not a cure, and neither is chemotherapy. These are not cures because there isn't one. Crizotinib has shown through a couple of studies to increase survival rates by about 45 weeks. However, it hasn't yet shown us any actual increase in rates of complete survival, this could be from lack of data as well though. It is very difficult to compare overall survival rates right now because all the people who were doing chemotherapy are now taking Crizotinib. No one seems willing to give up this chance, and they shouldn't. On the other hand even when an individual does beat this cancer, it almost always returns. Maybe soon we will be able to say otherwise. For now though progression-free survival seems like a very real possibility for people who take this drug.